The first time I met John Moehring was in a bar in Seattle, even though Moehring doesn’t drink. Sitting next to this mild-mannered gentleman—his gray hair cut short, Elvis Costello eyeglasses perched on his nose, a brush of a mustache crowning his perpetual smile—I wondered if this could really be the same guy who routinely created fantastically trippy posters for some of the biggest music acts of the 1960s, such as The Doors, Donovan, Frank Zappa, Country Joe McDonald, Jefferson Airplane, and the Grateful Dead. Moehring’s art was famous among a small-but-enthusiastic cadre of rock-poster collectors for pushing color and composition to the edge of legibility and beyond, but the sweet old man sitting next to me didn’t look the least bit psychedelic at all. Almost half a century earlier, Moehring had fallen off the face of the Earth, or so it seemed to the 50 or so rock-poster fans who’d heard rumors that on this particular night in the fall of 2015, Moehring might be spotted in this particular Seattle bar. 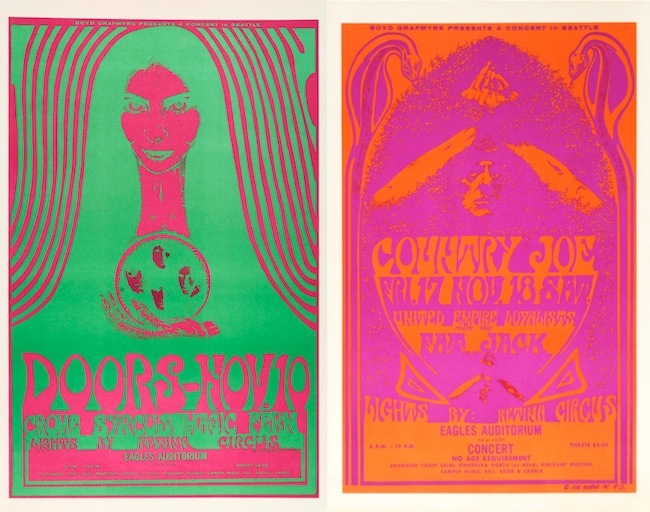 The occasion was the release of a book by Scott McDougall about the psychedelic concert posters that flowered in the Seattle area from 1966 to 1969. On a whim, Moehring had flown in from his home outside Houston to attend this minor literary event, but it wasn’t until he entered the bar that he got his first glimpse of the publication itself, a sizable percentage of which was devoted to his work. As he sipped a Perrier and absorbed the kind words of people holding their books out for his autograph, Moehring thumbed the glossy pages to find a suitable spot for his scrawl. Occasionally he’d stop and shake his head, clearly amazed to be looking upon yet another forgotten image from another lifetime. Some prompted stories about a band that had cancelled at the last minute, forcing him to get creative fast with his hand-lettering. Others dredged up memories of the endless hours he’d spent at a print shop in Seattle’s University District—the name escapes him now—to achieve his eye-boggling effects. To be sure, Moehring was touched by the affection of his fans, but the impact of the images on the pages was just as apparent, as if he was sitting down for a long-overdue visit with dear old friends. Moehring had not seen some of these two-dimensional friends for more than 40 years, a span of time that roughly coincides with his disappearing act at the end of the 1960s. In fact, Moehring hadn’t vanished at all after his career as Seattle’s premier psychedelic-rock-poster artist. He’d simply moved around like a lot of us do, juggling the preoccupations of work and family. And through it all, he never stopped making art. 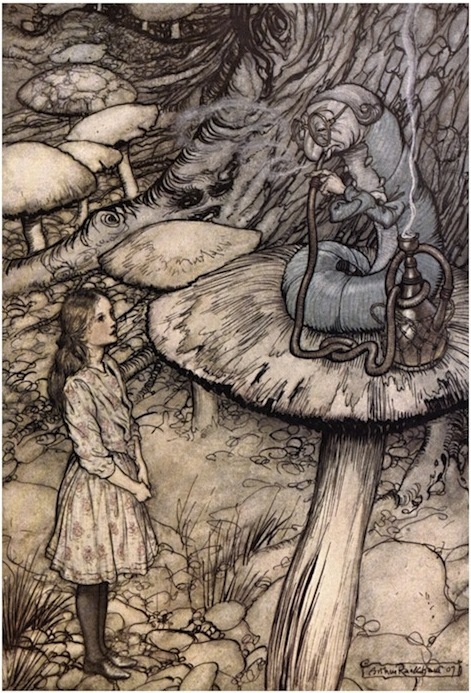 In addition to the portraits painted by his father, Bruce, who worked as an installer for the phone company, Moehring admired the art of Albrecht Durer, N.C. Wyeth’s paintings for Treasure Island, and just about anything by Arthur Rackham, whose illustrations helped generations of children—Moehring among them—imagine Aesop’s Fables, Grimm’s Fairy Tales, and Alice’s Adventures in Wonderland. If that sounds glib, it might help to know that even today, the mention of the Vietnam War causes Moehring to wince. “I had many friends, believe me, from high school and beyond, who went over there and came back as heroin addicts or were just really messed up in their heads. Some didn’t come back at all. It wasn’t their fault they were put into such a horrible situation, but it also wasn’t right that when people came back from the war, anti-war protesters would spit on them. There was a lot of conflict in those days,” he says with a sigh. Moehring’s decision to leave the Naval Reserves also caused a rift between him and his father. “We didn’t talk for about three years,” he says. A 1966 visit to the Haight-Ashbury neighborhood in San Francisco made a big impression on Moehring. 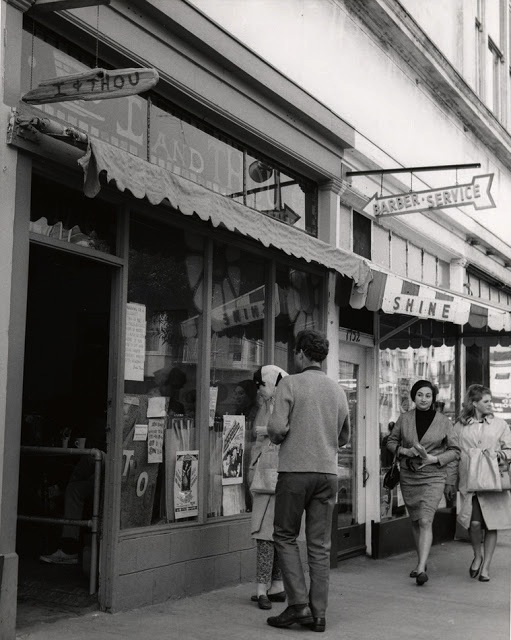 This photo of the I & Thou, circa 1967, is courtesy of the San Francisco History Center, San Francisco Public Library. Back in Seattle, with no commitments to the Naval Reserves and a waning interest in school, Moehring had plenty of time to linger in places where like-minded souls at loose ends congregated. Often he’d pull out a pen or pencil and occupy his time by sketching. 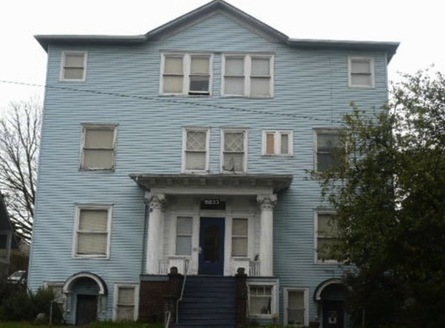 Favorite haunts included the Pamir House on University Way, which had opened in the early 1960s as an Indian restaurant but was mostly a coffee house with folk music on Friday and Saturday nights by the time Moehring started going there. A block north was the Eigerwand, an even smaller caffeine dispensary that had the advantage of being open in the afternoons. And at night, flashing his weathered student ID card and winking at friends manning the door, Moehring attended concerts at the UW’s Hub Ballroom, which was run by a student named Chuck Trimble, who created a lot of the posters for Hub shows headlined by bands with names like Daily Flash and Magic Fern. That’s probably where Moehring met an up-and-coming concert promoter named Trips Lansing. “I was just hanging out, meeting a lot of people,” Moehring says, “but the specifics of when and where I met Lansing elude me.” However it happened, the contact was fortuitous. Seeing the growing counterculture movement in Seattle, Lansing had decided to leverage his first name and the legacy of the 1966 Trips Festival in San Francisco to produce a Trips Festival of his own, which was held on March 19, 1967, at Eagles Auditorium downtown. The headlining act was a Los Angeles band called the Seeds, with support from Pacific Northwest stalwarts Daily Flash, Emergency Exit, P.H. Phactor Jug Band, West Coast Natural Gas, and Magic Fern. 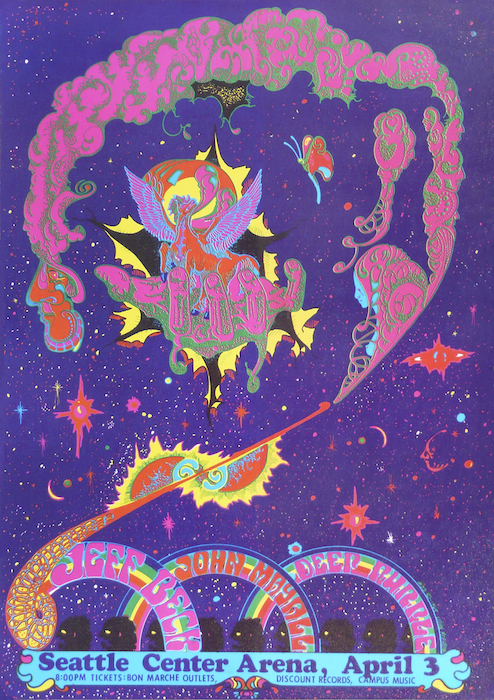 Moehring’s poster for Seattle’s first Trips Festival in 1967 featured a layer of florescent ink that glowed under a black light. 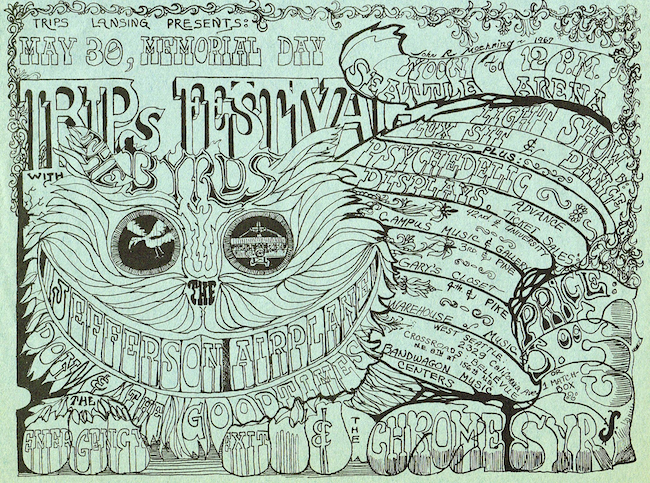 Moehring’s poster for Seattle’s second Trips Festival, also in 1967, invited patrons to pay for entry with a matchbox full of marijuana. On March 23, between the two Trips Festivals, a critical future catalyst of the budding Seattle rock scene hit the streets. It was a newspaper called the “Helix.” In his 1995 book, Rites of Passage: A Memoir of the Sixties in Seattle, Walt Crowley claims to be the first person to pay 15 cents for a copy of the paper’s 12-page debut. A few issues later, after an initial bout of skepticism that Crowley later chalked up to mild jealousy on his part, the budding young radical joined the staff. 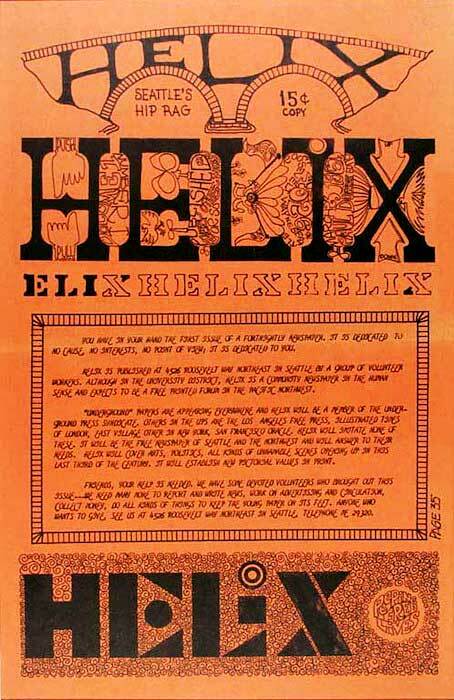 The “Helix” was the voice of the Seattle counterculture in the late 1960s. In retrospect, it was almost as if the “Helix” came into being to give Crowley a platform for both his politics and his pen. Putting his drawing skills to work, he became the paper’s “Rapidograph in residence,” illustrating everything from articles to advertisements. 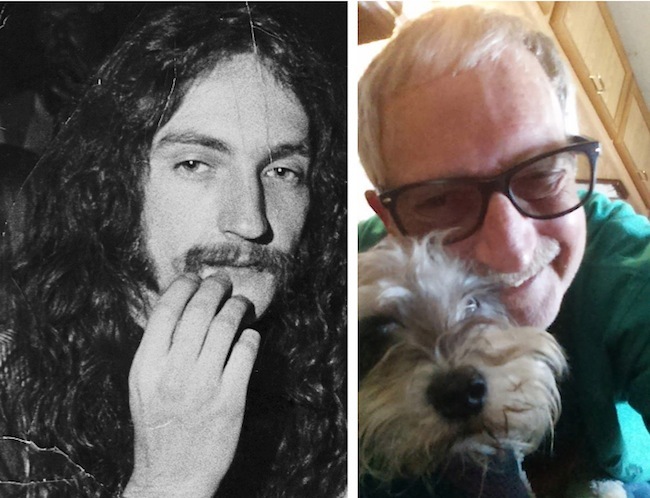 Before the ’60s had ended, he would also become a leading political figure of the Seattle counterculture, at one point running unsuccessfully for state office as a candidate for the Peace and Freedom Party. 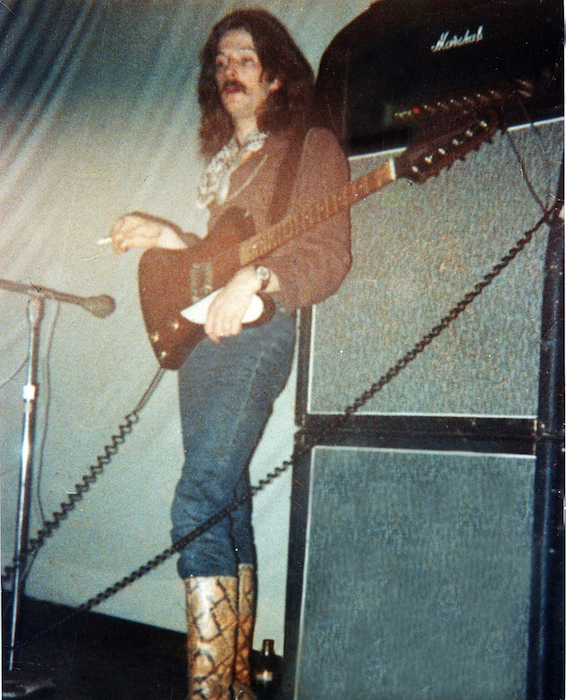 For a while, the “Helix” was both the publicity machine for shows at Eagles as well as its booker, but Dorpat soon realized that he and his team could not do both at the same time—at least not well—so they handed over booking duties to another rising rock impresario named Boyd Grafmyre, for whom Moehring would design at least 20 posters between 1967 and 1969. 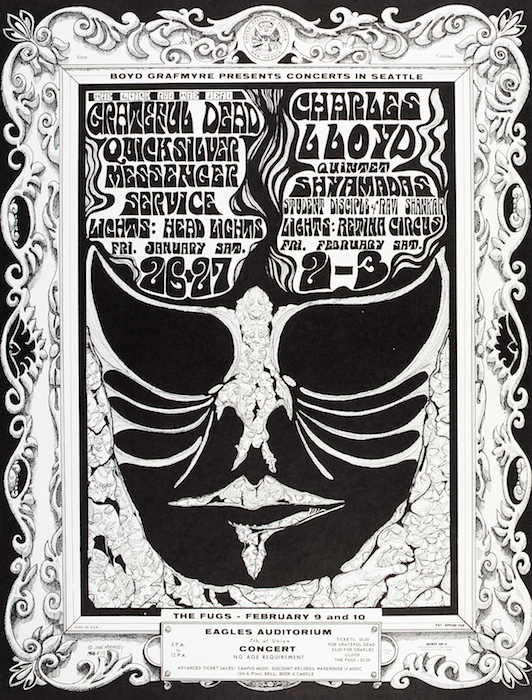 Moehring’s first poster for Eagles promoter Boyd Grafmyre was for a pair of Grateful Dead concerts in 1967. 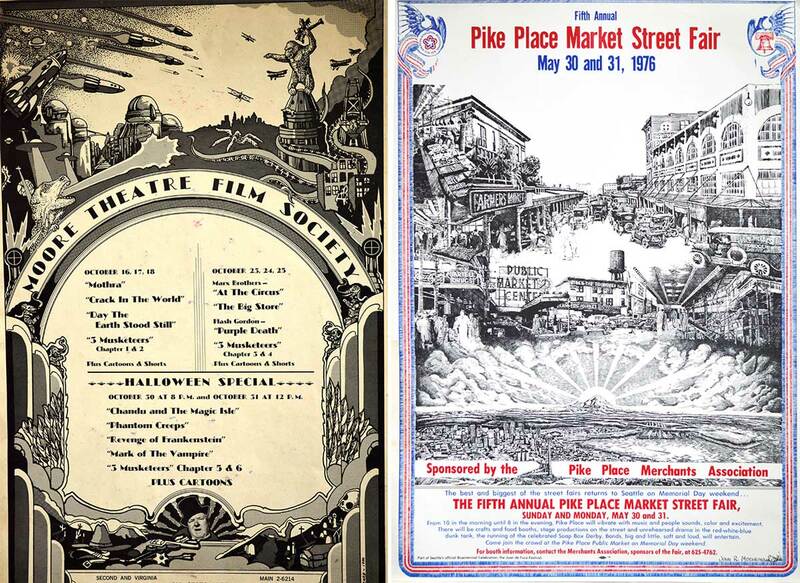 The handbill version is shown here. Moehring would eventually design more than 20 posters for Grafmyre. 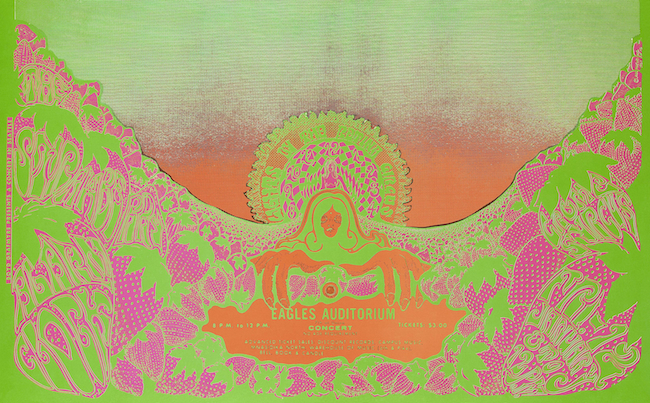 According to Grafmyre, the first Eagles Auditorium poster Moehring designed for him advertised a pair of Grateful Dead concerts on September 8 and 9, 1967, which also happened to be the first shows Grafmyre says he made any money at. Moehring’s last assignment was for Grafmyre’s Seattle Pop Festival, a three-day outdoor concert held in a park just northeast of town from July 25 to 27, 1969, a few weeks before Woodstock. In the intervening years, Moehring produced posters for Grafmyre that resembled everything from the pen-and-ink wizardry of his childhood hero, Arthur Rackham, to the psychedelic color experiments of San Francisco poster artist Victor Moscoso. Which is not to say Moehring’s work was merely derivative. Rather, Moehring was more like a sponge, soaking up ideas and reworking them until they were his own. “Eventually, you kind of fall into something that’s yours,” Moehring says. 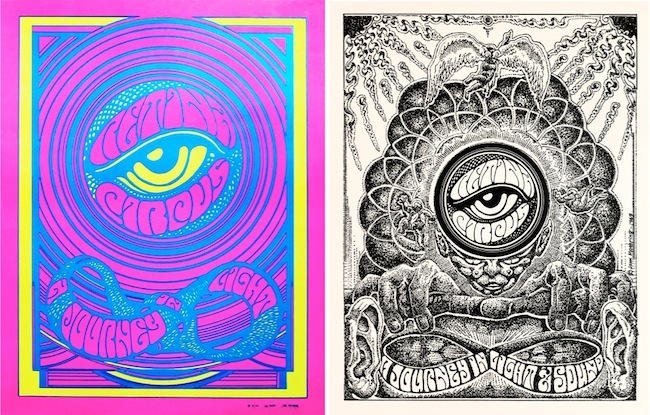 Stylistically, Moehring’s art could range from Arthur Rackham influenced drawings (above, left) to Victor Moscoso-esque posters (above right). Though Moehring’s style varied during the two years he made posters for Grafmyre, his reputation as a perfectionist didn’t. Moehring was rarely early with his assignments, usually working right up to the last minute, unfazed by the presence of Grafmyre’s assistants hovering about and nervously glancing at their watches to see if they still had time to get his creation to the printer. More often than not, Moehring would join them, and then it would be his turn to look over the shoulder of the printer, to make sure the particular cacophony of color he had in mind was realized to his satisfaction. Sometimes the results were all but illegible, as in a horizontal poster he designed for a concert at Eagles in January of 1968 (see top photo). The main image was a field of strawberries, an obvious nod to the headliner, a psychedelic-pop outfit from Los Angeles called Strawberry Alarm Clock. 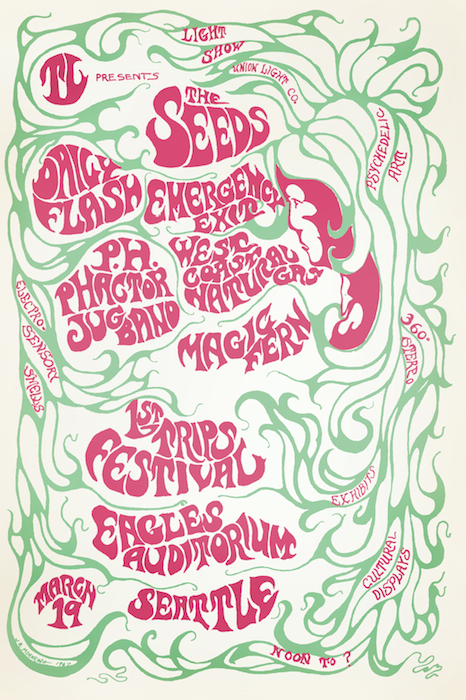 In response to a request from Grafmyre to try and make his Eagles posters more legible, Moehring created this design for two weekends worth of shows in 1968. Posters such as these from late 1967 were produced by inking both the positive and negative printing plates, thus filling 100 percent of the design with rich color. Moehring met a lot of musicians during the late 1960s, but not because they were lining up to tell him how much they liked his posters. 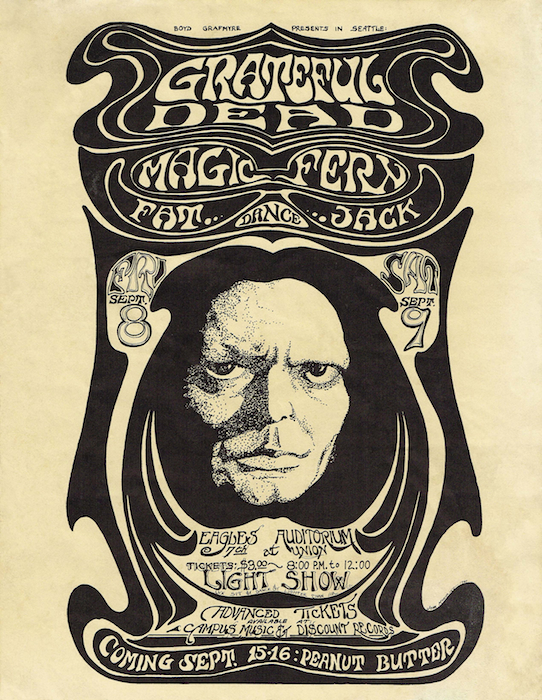 In addition to being one of Seattle’s most prolific rock-poster artists, Moehring was also a member of one of the area’s premier light shows, Retina Circus, which had been co-founded in San Francisco by a friend of Wes Wilson’s named Bob Carr, before Carr moved it north. Retina Circus did most of the light shows for Grafmyre at Eagles and elsewhere, making Moehring’s role in the Seattle music scene doubly pivotal. 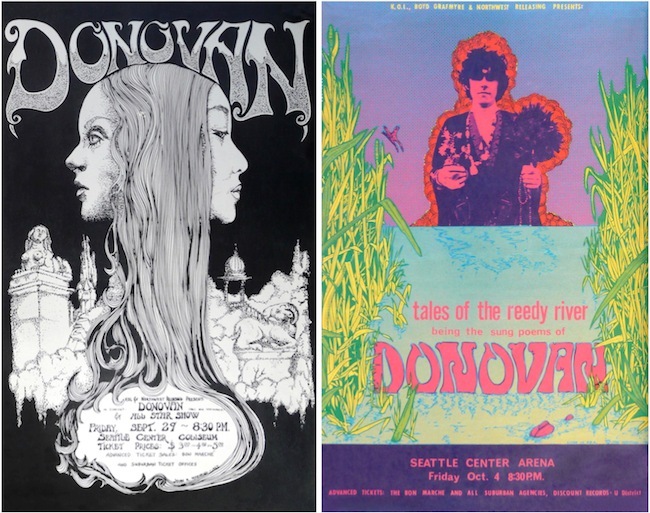 Moehring designed several posters for Donovan concerts—the second one prompted the English musician to call Moehring back into his dressing room so he could thank him personally for his work. Too far to the left for his father but too far to the right for Crowley, Moehring moved out of the Monarch and bounced around a bit before settling into the basement of a house rented by a few members of Retina Circus. And it was there that Moehring met many of the musicians who would be booked into Eagles or the Arena by Grafmyre. This Moehring collaboration with one of his rock-poster heroes, Wes Wilson, was first printed in 1968 to promote the Retina Circus light show. Moehring reworked it the following year as a drawing. One of Moehring’s fondest memories is of an evening spent with English rocker Marc Bolan of Tyrannosaurus Rex—his second band, T-Rex, and its big hit, “Bang a Gong (Get It On),” were still a few years away. Accompanying Bolan on this particular evening was his then-girlfriend and future wife, June Child. Against this backdrop of hobnobbing and hijinks with rock stars and their girlfriends, Moehring’s art was quickly evolving. 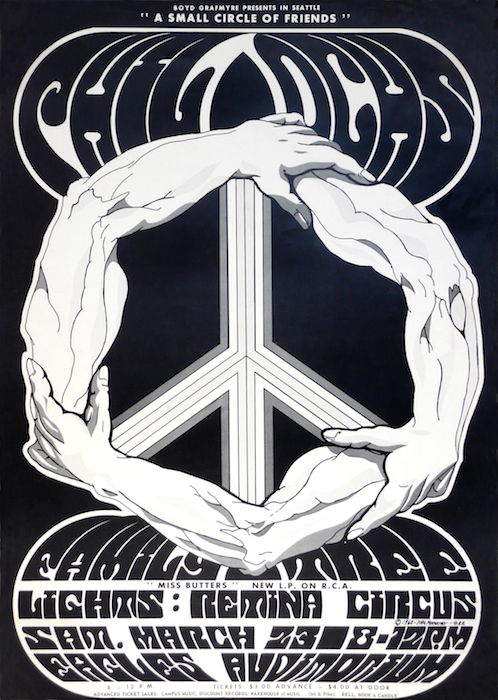 By the spring of 1968, having wrenched all of the psychedelia he could from the process he’d employed for posters advertising concerts by The Doors, Strawberry Alarm Clock, and others, Moehring returned to drawing, as seen in the interlocking arms he penned for a Phil Ochs poster in late March. One of Moehring’s first politically charged posters was for a show by folk singer Phil Ochs, who was known for his anti-Vietnam War activism. Even more profound than this aesthetic shift, though, was the introduction of overtly political content into his work—events in the real world were now proving impossible for Moehring to ignore. Consider these news items from the first half of 1968: In late January, North Vietnamese troops and the Viet Cong launched their morale-sapping Tet Offensive, souring the U.S. public’s sentiment for the war and prompting the nation’s most respected television news anchor, Walter Cronkite, to tell his millions of viewers that it was time for the United States to head to the bargaining table and negotiate a speedy end to the deepening quagmire. And then in quick succession, between March 16 and April 4, Robert Kennedy announced he was challenging Lyndon Johnson for the presidency, Johnson announced he no longer wanted the job, and Dr. Martin Luther King, Jr. was assassinated in Memphis. Two months later to the day, Kennedy would also be murdered, becoming the second member of his family in less than five years to be gunned down in public. Thus, Moehring’s demonstration of his ability to draw arms was hardly the most important aspect of the Ochs poster. Rather, it was the peace symbol within the encircling limbs, a nod to both the politics of the performer and Moehring’s willingness to wear his politics a bit more prominently on his sleeve. 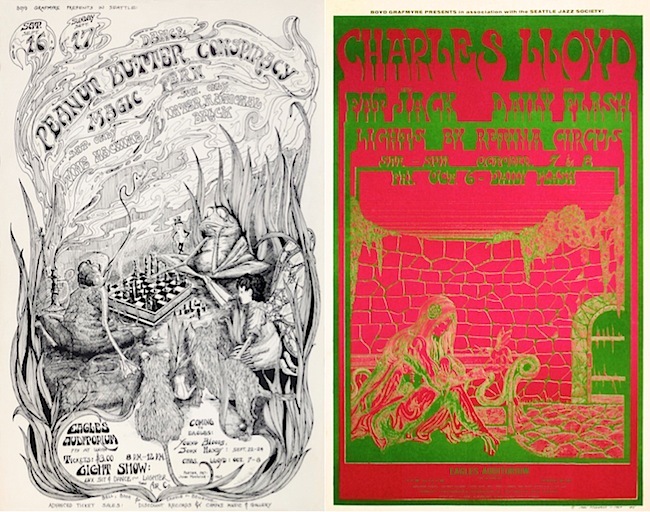 Two more examples of concert posters from Moehring’s anti-war period in the spring of 1968. A week and a half later, this political trend continued with a poster for a show at Eagles headlined by a power trio called Blue Cheer. 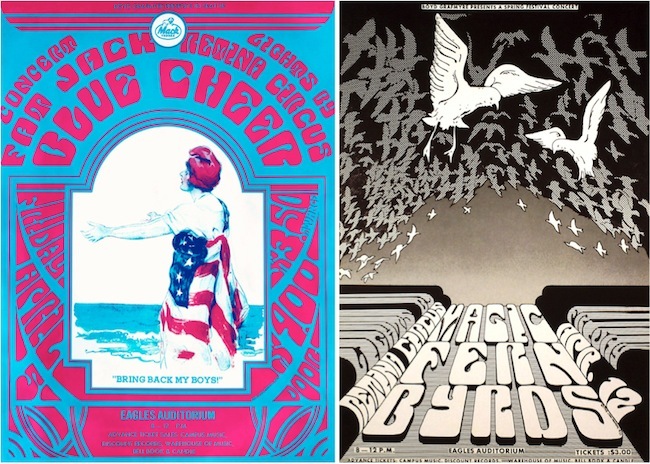 With band names and the show’s date in contrasting colors of vivid red and electric blue acting as a frame, the central image featured a reproduction of an illustration of Lady Liberty, wrapped in an American flag and crying out “Bring Back My Boys!” A week later, for a poster advertising a Friday night concert by The Byrds, the illustrated birds flying in an almost M.C. Escher pattern above the band’s name were all doves, obvious symbols of peace. Then, in a poster dated April 26 and 27, 1968, Moehring went even further. Headlining the bill was the most political rock band of the era, Country Joe & the Fish. Predictably, perhaps, a peace sign was an important part of the visual mix, but this time it hovered over a photo by Forest Goodwin of anti-war protesters flashing the peace sign. Bordering the composition was a collage of news headlines—“War Puts Strain On U.S.,” “40 Negroes Protesting Are Jailed,” “Hippies Can’t Be Curbed”—giving voice to the issues consuming the minds of the nation’s youth, including a poster artist named John Moehring. 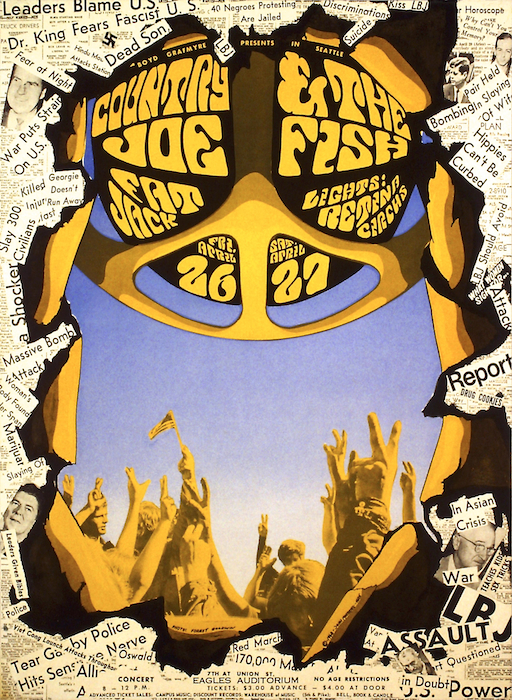 Moehring drew, used collage, and incorporated photography into this poster for a pair of Country Joe & the Fish concerts in April of 1968. That fall, Moehring’s art continued to morph. 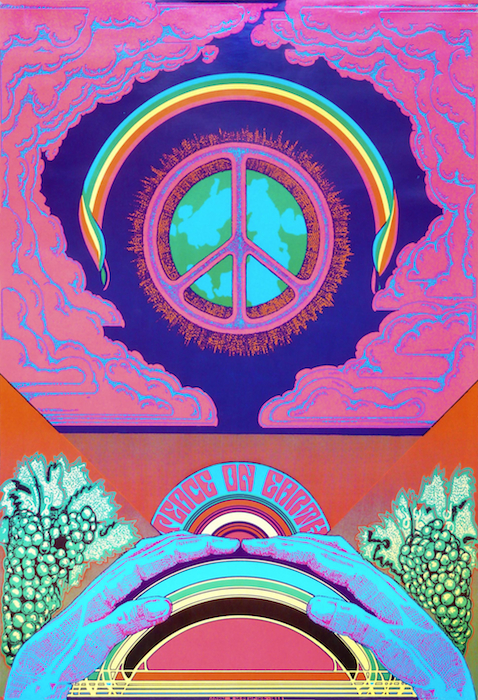 By the end of 1968, for a Christmas poster published by Grafmyre to spread the traditional, but now politically charged, sentiment of “Peace on Earth,” Moehring returned to his positive and negative plates, this time inking three of each to produce all the colors of the rainbow. In December of 1968, the traditional Christmas sentiment of “Peace on Earth” was suddenly political. This poster was designed by Moehring for Grafmyre. 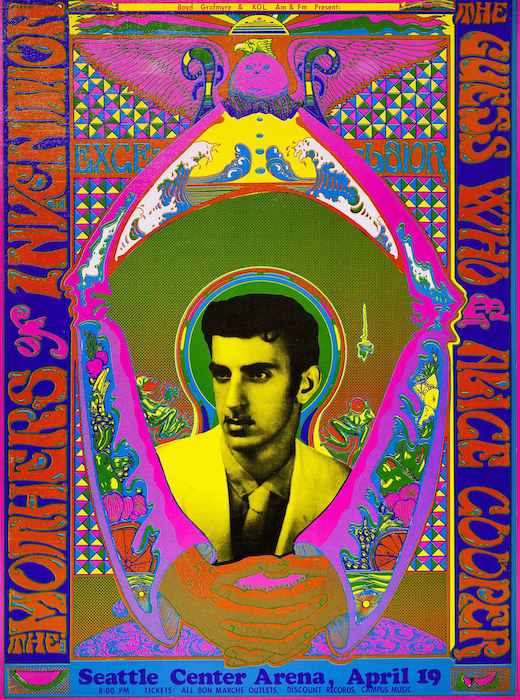 In many respects, the poster Moehring created for an April 1969 show at the Seattle Center Arena featuring the Mothers of Invention, the Guess Who, and Alice Cooper represents the zenith of his rock-poster work in the late 1960s. Anchoring the composition was a yellow-tinted black-and-white photo of lead Mother, Frank Zappa, appropriated from the back cover of the band’s “Cruising with Ruben & the Jets” album. Surrounding Zappa are Egyptian icons, frogs, clasped hands, sliced oranges, Hokusai-like waves, a character resembling Humpty-Dumpty, and scores of tiny triangles in pink, yellow, green, and blue. Did I mention the shape at the bottom of the poster that resembles the meteor-pocked surface of a small moon? By the spring on 1969, Moehring’s posters had become extraordinarily complex, both in terms of their appearance and what it took to produce them. As the 1960s stumbled to a close, Moehring didn’t so much as walk away from the Seattle music scene as it walked away from him. Simply put, the economics of producing shows at Eagles worked fine when you were paying a band like The Doors $2,500, which was their fee in 1967. But by 1969, when The Doors were the headliners at the Seattle Pop Festival, their going rate was $50,000. Ticket sales at Eagles were now too small to support bands like that. 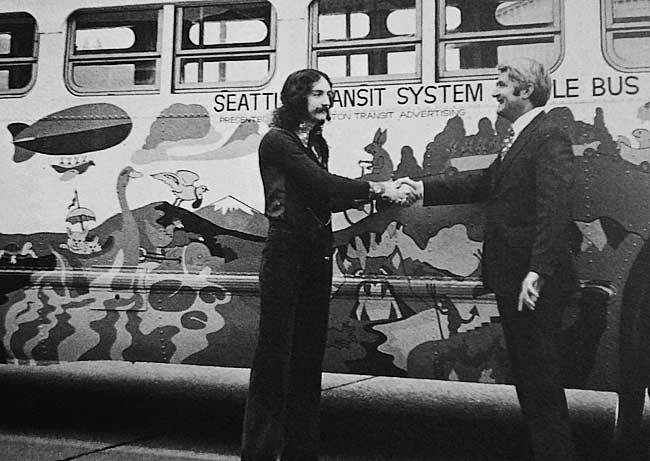 Moehring with Seattle mayor Wes Uhlman in front of Moehring’s hand-painted People Bus. In the 1970s, Moehring added the airbrush to his artistic arsenal, creating several posters for a regional beer brand called Heidelberg. After the costume shop went bust, Moehring reached out to a customer who moonlighted as a clown. He got Moehring a gig doing electrical diagrams and schematics for aircraft (“I knew mechanical drawing from high school,” Moehring says), and that stint was followed by a run of advertising work for a company called Warn, which still makes the little knobs that are installed at the ends of a car’s axle, so it can be manually put into four-wheel drive. Here, though, Moehring’s story becomes the opposite of free flowing. At some point during his second career in advertising, Moehring divorced, remarried, and then had two children in the late 1980s—Hunter, who plays guitar in a rock band, and his older sister, Heather, who’s a registered nurse and mother of Moehring’s only grandchild, Chance. For a few years in the 1990s, work pulled him to Los Angeles, separating him for periods of time from his family, but eventually Moehring settled in Texas, where he continues to live with his dog, Ronnie, and is close enough to see his kids. Moehring used a lot of purple in his late-1960s rock posters, but this one advertising a show in April of 1969 headlines by Jeff Beck seems—in retrospect, anyway—an homage to the band at the bottom of the bill. 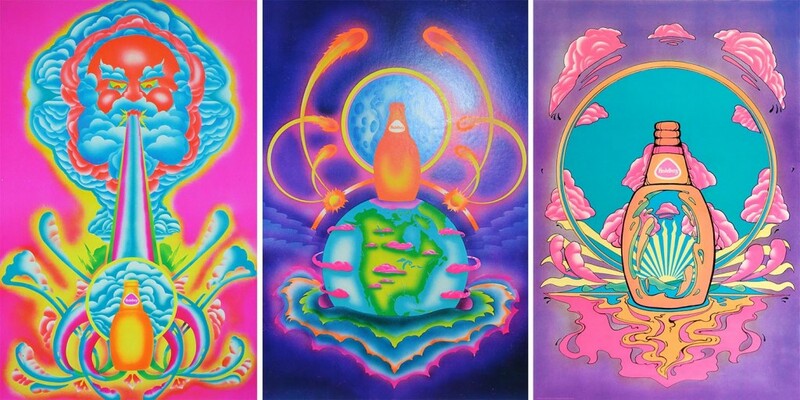 Although Moehring is not the sort of person who’s preoccupied with the good old days, he did manage to hold onto a few of his posters from his psychedelic years. “I guess I kept them because I enjoyed making them,” he says, “but I never thought of preserving them for future posterity, or that they’d be of interest to anyone.” In fact, some of Moehring’s posters are more difficult to find than many of the most-sought pieces by San Francisco’s most famous poster artists, with prices to match. At the First Rock Festival, Pianos Fell From the Sky Rainy Day Psychedelia: Seattle’s 1960s Poster Scene Gets Its Day in the SunWas Levon Mosgofian of Tea Lautrec Litho the Most Psychedelic Printer in Rock? as a history collector I collect. rock Posters to pass on to the next generations. I feel it is important and have wrote all about the times, my travels and the influence lof the music. Is it possible to know where might I be able to view and ultimately purchase some of these posters? What an amazing selection of posters by Mr. Moehring. Detroit’s poster artist made it into Paul Grushkin’s book, but I don’t remember seeing any of these. I’m sure the rest of the book is of the same quality. Seeing these are really like stumbling upon another pyschedelic poster community – which we have, in Seattle, collected here in this book! This will be a volume to own and enjoy. Posters from this era have always made me smile! I found four of these treasures in a trunk my mother has, from the shows my uncle attended in his youth. I had them framed and have always enjoyed them without ever knowing about the artist. Definetly interested in learning more about him. I was enthralled on every word I read here!! A wonderful Gentleman Mr. Moehring!! Awesome history of the man! Thank you! Just heard from a good friend that John passed away this month; we worked with John years ago in the legal graphics field. I went out to Seattle one time to learn from him about PCs, codes, paths, etc. ; I learned more about the local brews thanks to him. Our biggest moment during those two weeks was finding his daughter’s missing rabbit, which was in a closed drawer in the bathroom (the rabbit was fine by the way). I haven’t seen him since those times but never forgot what an amazing guy he was and funny as hell. God Bless you John.